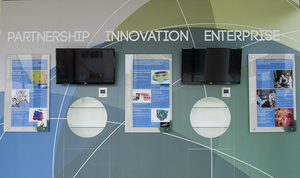 The combination of facilities and experience available at the ILL and ESRF provides industrial users with access to technology beyond compare. The ESRF's 80 X-ray beamlines and ILL's powerful neutron delivery system provide probes of light of exceptional brightness. Scientists from both academia and industry regularly reserve beamtime on the highly specialised instruments available at the two institutes. X-ray and neutron beams provide unique, powerful, and non-destructive access into the heart of materials, over length scales ranging from the centimeter to the atom. The two methods can be complementary, for X-rays can probe the electronic clouds of atoms whilst neutrons pinpoint the position and motion of nuclei or map magnetic fields. What do we offer industrial clients?